I’ve been wanting to get a striped culottes for a while now. For some reason, I never made the purchase. So when I spotted these culottes at Banana Republic and I had the opportunity to get them, I picked them up so quickly! I instantly fell in love with the black & white vertical stripes with it’s paper bag-waist style. Everything about it is so classic yet chic & fashion forward. These pants definitely make a statement. All you need is simple top. There are so many different ways I wanted to style these pants. 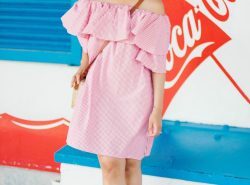 I would exchange the strappy heels to a slingback heels in the Fall or have a little fun with top with this bell-sleeve lace top or a blush tie-neck blouse. The pants may be bold, but the options are endless! I also think wearing these pants/culottes would be perfect if you are trying to spruce up your workwear wardrobe. They are work appropriate with a lot of flare and style. Pretty much you would be the chicest girl in the office. However, I think they are also great for a night out with the girls or date night with your man. I plan on wearing them to all 3 of those scenarios. I seriously love them! They fit so perfectly! Like I said above, the options are endless. Love love love this look!! I miss my high waisted culottes so much! This striped pair with the bow is perfect. You look amazing! Of course I have always been a fan of culottes but something extra about the striped ones with the ankle sandals and black, so so beautiful! Thanks Andrea! You can never go wrong with stripes! Oh such a wonderful look! These culottes are simply amazing! Rach you always look so perfectly polished! Those pants were made for you, I adore the cut and the paper bag waist. Your right the possibilities are endless…perfect for the office or a night out, however you wear them you look fabulous! Aw you are so sweet Auna! Thank you so much! These are so much fun!! I absolutely love culottes! They are such a great pant for the summer too! I'm not always a up for a skirt or dress so these are a perfect alternative! BR is really killing it right now! Super stylish look, simple and elegant! These culottes are so chic! Such a stylist outfit! These culottes are simply beautiful! I've seen you rock a lot of bottom half stripes lately and I am just tickled to day "Damn Rach, back at it again with the stripe pants." Oh man, I hope you thought that was a little bit humorous and "got" my little joke. (; Never the less, these looks suit you. They are timeless, classic and look so fresh. Keep them coming! Haha yes I got your joke! I'm glad you like my stripe pants. I just love them. A lot has to do with how awesome BR is with their collection. I barely had to do much to style their stuff! I am so crazy for culottes and these are FABULOUS!! I love everything about 'em!! Cutest look lady! Oh yea definitely will wear it as much as I can! Thanks Samio! LOVE these! I ordered something similar from Forever 21 but they were way too wide-legged. These are perfect! Hope you are feeling well and having a good week! Thanks Mikela! I'm feeling good, thanks for asking! Love this look, so chic! I still need to get a pair of culottes! I definitely get where you're coming from! I have a pair of black culottes, but a fun pair are on my mind! Cute cute cute!!! Looove this look! I love this pairing! It's so chic and summery! Thanks Narhee! They're comfortable too! I totally agree that culottes can be worn to work. I love your stripped culottes, they are elegant and edgy and you styled perfectly with the black top. You're definitely making the case for culottes here, lady- these striped versions look amazing on you! Those pants are super cute on you! You look great! loving the stripes! you look beautiful as always! All things yes to this look! So easy breezy, and the culottes look great on you. Love the tie waist! umm yes to this whole look! You look amazing in those pants! so chic! These striped pants are seriously amazing!!!! Flawless look, babe! Those pants are just Perfect! Culottes have really grown on me. At first, I thought I couldn't wear them since my legs were so small. I love these striped ones on you! Thanks Candace! You totally can! You look so stunning girl, I love the culottes on you! Love this outfit, this combine is amazing! That looks soooo awesome! These striped culottes are so en vouge this summer! Thanks Colli! Culottes can make any outfit so chic! love these pants!! such a great look for work in the summer.